Getting Started | Nyahoon Games Pte. Ltd. Choose a large environment object(s). Remove shadows from the large environment object(s). Create a shadow receiver object and give it some information of the environment object(s). Assign a projector reference to the shadow receiver object. If you already have blob shadow projectors in your scene, Easy Setup Wizard is available (from Version 1.4.0). You just need to follow the instructions in the wizard. Please refer to Easy Setup Wizard for Projector Manager for details. If you are using shadow-map, or you don’t want to use the Wizard for some reasons, you can do the setup manually in Inspector View. Please refer to the following sections for details. Even if you are going to use Easy Setup Wizard, the following sections will be helpful to understand the details. If you have only a few projectors, see Steps to use Shadow Receiver with Projector. 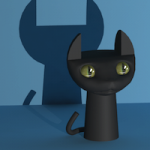 If you want to use shadow-map, see Steps to use Shadow Receiver with Shadow-map. If you want to have many projectors or to spawn projectors at runtime, see Steps to use Shadow Receiver with Massive Projectors. For light projection, the steps are almost similar to the steps for shadows. The difference is only a shader assigned to a Projector material. You can use “FastShadowReceiver/Projector/Light x Shadow” shader. Additionally, you can add “Fake shadows”. Add “Light Projector Shadow Receiver” component to Light Projector objects, and add “Light Projector Shadow Caster” component to shadow caster objects. For more details, please have a look at SpotLights + Fake Shadows demo scene. For bullet marks projection, you can also follow the steps for shadows. Just change the Projector shaders. However, you might not want to use lots of Projectors for bullet marks. BulletMarkReceiver script in BulletMarks demo scene is an example for generating bullet marks from a single Custom Projector. Please have a look at the demo scene, and customize the script to make it fit your application. If you want to use a Mesh Tree for multithreaded raycast, please have a look at Multithreaded Raycast Demo. Also, see Create a Mesh Tree section.